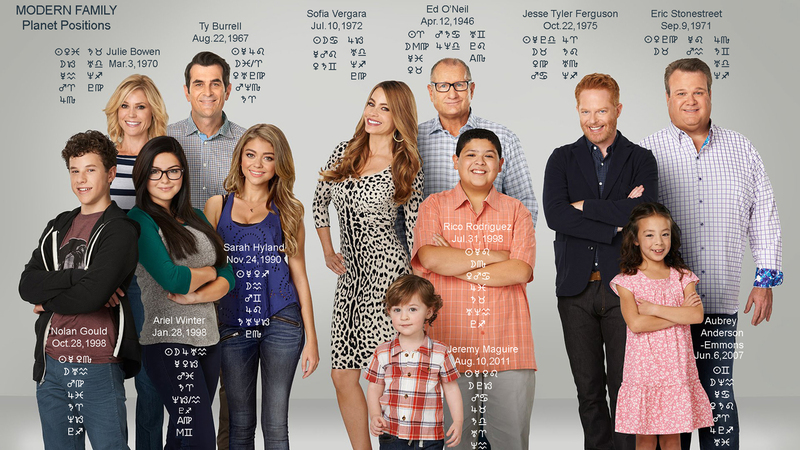 Modern Family is one of the few quality sitcoms of the last decade(2009-2019). It is funny, well-written, and well-acted. Knowing the charts or planet positions of the cast of characters makes it all the more interesting or enjoying to watch. Yes, they are only acting, but much of the true character and chemistry of the characters comes out nonetheless, and is an excellent way to study astrology. Below is an image of the main characters with their planetary positions listed in glyph form. Only the Ascendants(A) and Midheavens(M) of a few characters are known. Of the twelve characters in the image, Sun in Leo shows up 3 times(Ty, Rico, and Jeremy), with Taurus and Capricorn missing. All the adults(with the possible exception of Ty) have feminine Moons with the Earth signs dominating. Moon in Aquarius(Noland, Ariel, Sarah, and Aubrey) is surprisingly common , with Scorpio(Rico) and Capricorn(Jeremy) remaining. The Mercurys are overwhelmingly masculine among the adults, with Leo dominating, and evenly divided among the young ones. The Venus signs are fairly mixed among all twelve with Venus in Virgo dominating. The Mars signs are also fairly well mixed with Mars in Cancer(family issues) dominating. Jupiter is fairly mixed, Aries dominates the Saturn signs, Uranus is predominantly in air and particularly in Libra and Aquarius. Neptune has 1 Libra, 1 Scorpio, 4 Sag, 3 Cap, and 3 Aqu. Pluto covers the generatiions from Leo to Capricorn with Virgo and Sag dominating at 4 each. Ascendant signs are so important when it comes to relationships(followed by Moon signs). It's a shame we don't have the Ascendants for most of them. Usually there is Sun/Ascendant conjuntion or opposition between close partners. I would venture to say that Bowen, Vergara, Hyland, and possibly Jeremy and Ty are in the masculine Ascendant group with the others in the feminine Ascendant group. Winter's Virgo and O'Neil's Scorpio are correct. Bowen could be a Gemini or Leo rising which would explain her affinity with Leo Ty, and Vergara's surface apprehension of her. Vergara is definitely air or fire rising. Hyland is fire, Rodriguez is Cancer(that and his Venus and Mars are why Vergara has such a soft spot for him), Stonestreet appears to be Taurus, Ferguson possibly Pisces, and not sure about the rest. These are only guesses so don't take them to heart.